Making Greek green beans today. Sliced onion with oregano and parsley sauted in some light olive oil until onions are translucent. Add some canned diced tomatoes and keep cooking on low heat. Add fresh green beans, stir all together, then cover and cook on low heat for several hours. They are so yummy! I made enough to freeze. Saw this beautiful recipe for cranberry apple butter and I am going to make it on Wednesday. Plus today I am making pork marinated and cooked in coconut milk, ginger, onions, garlic, fish sauce, curry, and other stuff. I am going to cook couscous to go with. Pasta with white wine, red pepper, parsley and garlic steamed Prince Edward Island mussels. The wine, pepper and garlic gives the mussels a sweet flavor. Rolling the pasta in the steaming sauce gave it an excellent richness. It paired beautifully with the pan seared NY strip steak. My dinner turned out pretty good. One thing I learned though, if you use fish sauce in your recipe and you want a thicker sauce, DON'T reduce your runny sauce! Instead thicken with cornstarch slurry. Of course I don't have any cornstarch and reduced my sauce by evaporation. It's too salty, so for the leftovers, I'll add in some water and use the cornstarch slurry to thicken. It paired well with the couscous, I added some parsley curry powder, and cinnamon. That’s the thing I love about cooking, the constant experimentation and moments of, “Oh yes! That’s money!” And a few “Well...we won’t do that again!” Like when I was making my gumbo I added salt and then added my creole seasoning without tasting it before because I THOUGHT I remembered the flavor profile then...omigesus too much salt! But now I know enough how to fix that, so out comes the sugar. And within a couple minutes I had it balanced. 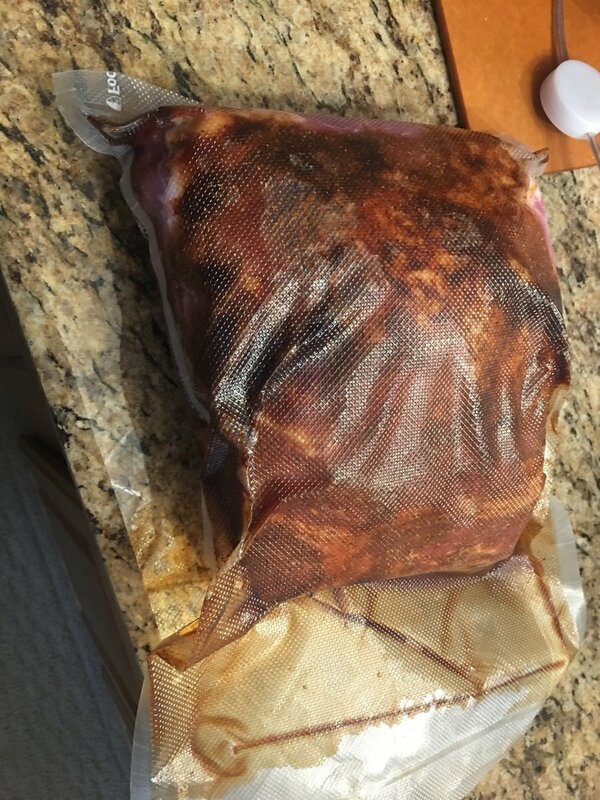 Starting a Sous Vide pork shoulder for pulling. Set at 165 for 24 hours. 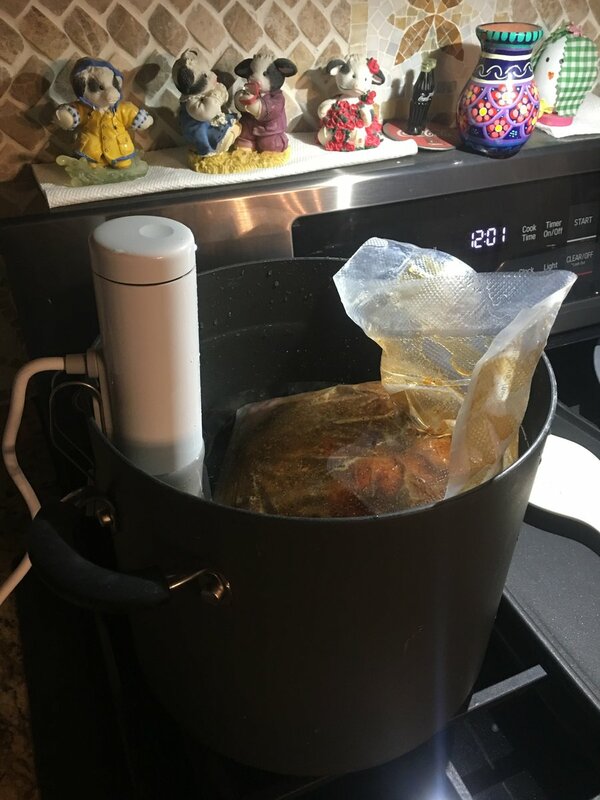 I love my Joule sous vide, the app makes it so easy to work with. 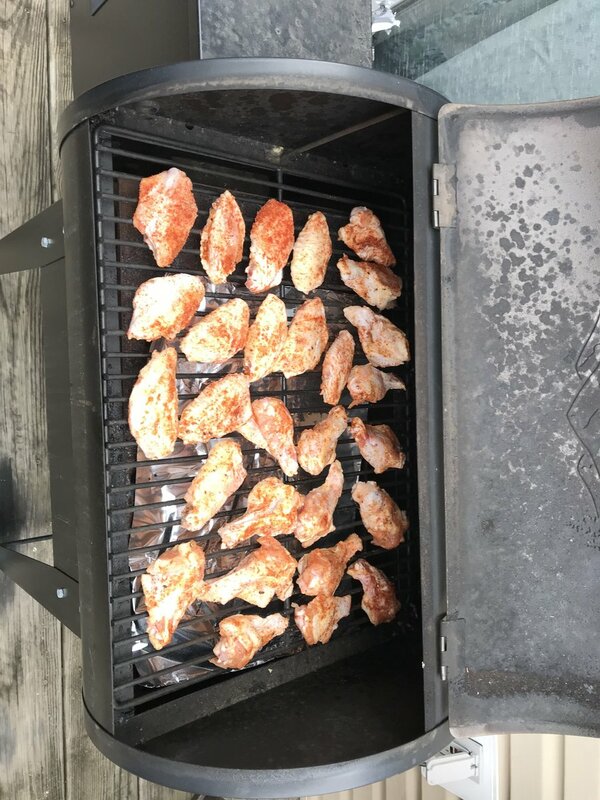 Talked about smoking and frying wings a while back. I did some on a Sunday for Skins/Boys. 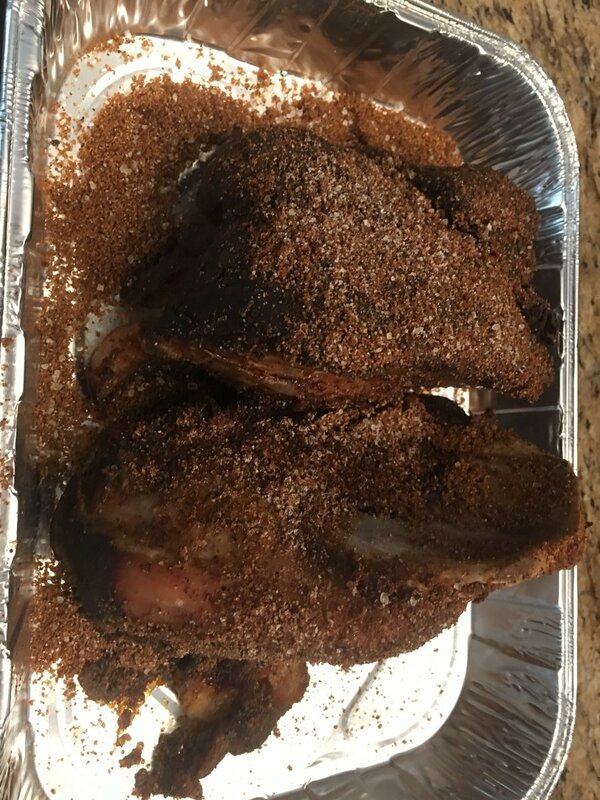 Rubbed down with paprika, salt, pepper, garlic, and onion powder. Smoked at 225 for about an hour and a half to two hours. 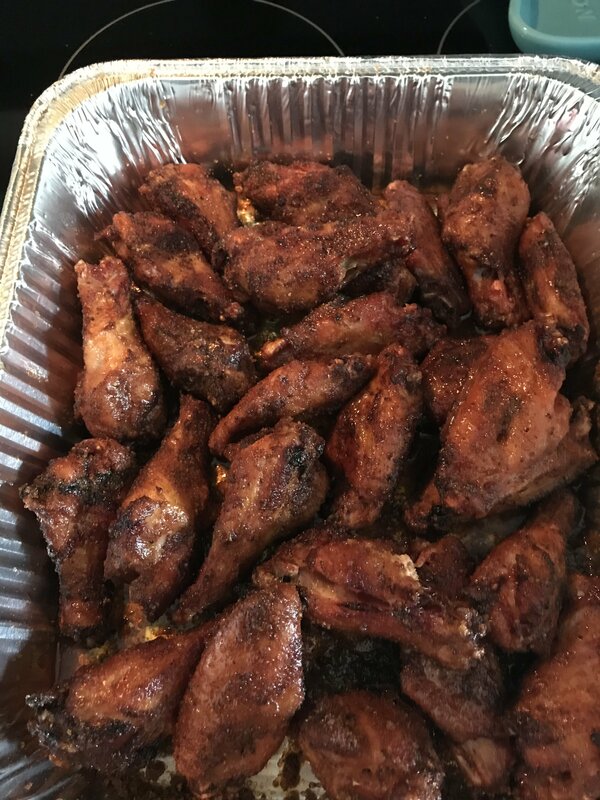 Finished in the deep fryer at 375 for a few minutes, as soon as they came out I tossed them in a combo of old bay and brown sugar and drizzled a little bit of butter on them. Did deep frying them wash out any of the smoke? It might wash a little smoke flavor out but the positive of the super crispy, tight skin makes up for it. The smoke flavor is still very prevalent. I read up on this a bit and people have varying ways to do it. 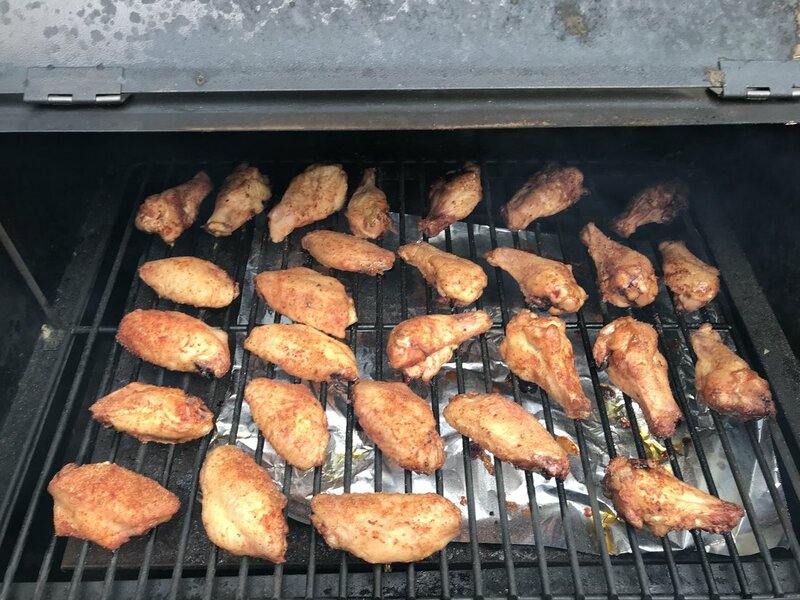 Some say to smoke only partially cooking the chicken before frying. They do a longer fry at 350. That would lessen the smoke flavor. I smoke at 225 until cooked through. I then flash fry them for about 2 minutes at 375 only to cook the skin and get it crispy. I think that’s the best way to get the most smoke flavor and crispy skin. On a side note, I lug the fryer outside on the deck by the smoker and fry out there. Because the smell of the deep fryer in my house disgusts me. Last time I fried in the house, it smelled like McDonalds for days. LOL!!! My wife's family is from Eastern Kentucky, I know EXACTLY what you're talking about. Seriously, she grew up and her father would always have a mug of bacon grease on the back of the stove to use instead of oil or butter. And they'd constantly add to the mug each time they cooked bacon. Imagine everything being cooked in bacon grease. My grandma kept a small bowl of bacon fat on her cooktop too. It's actually a good fat to cook with. Browning pork in it tastes good. I used to keep a ramekin of bacon fat in my refrigerator but it would get a grainy texture I didn't really like. Butter and oil seemed to be easier to emulsify too. 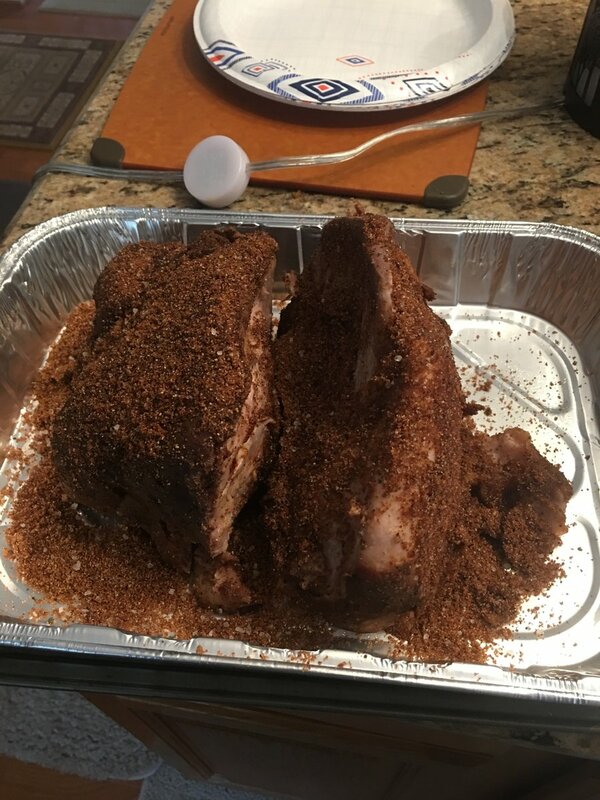 Dried off dry rubbed and ready to go in the oven. Finished. 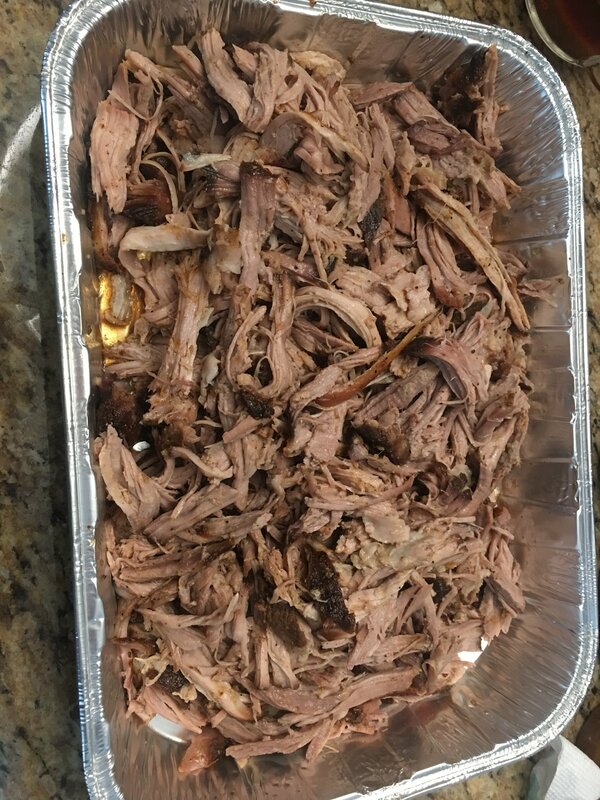 This is a great easy method to make good pulled pork. But smoking is better if you have the time and weather. @AsburySkinsFan those mussels are beautiful. That dish looks amazing. What kind of pasta is that? Just run of the mill spaghetti. I reduced the steaming liquid and added plenty of butter and oil so it became a silky, garlic, wine and mussle sauce. Super easy, and it was great the next day! Before refrigerating I shelled the mussels into the pasta then poired the sauce over. To reheat I just threw it all in a sayce pan and kept tossing...super yummy! That sounds fantastic. I thought you might have used bucatini because of how thick they looked. I prefer thick long noodles like those ones and udon. I like udon, rice, and pho noodles for asian recipes. For italian, I prefer cappelini or angel hair, and especially since diabetes occurred. I debated using angel hair, but with the amount of oil and butter I didn’t want it turning into a solid. I definitely like my noodles with some substance to them, udon is awesome, but never worked with it before. Making spaghetti squash with some tomato meat sauce that I have in the freezer. Good dinner after a good game. Those wings are needed in my life. Oh...oh, my goodness. This will be happening in my immediate future!! !